With an astounding impact energy at 6.1 ft-lbs., the RH540M SDS-max Rotary Hammer is the hardest hitting and fastest drilling rotary hammer in its class. Delivering up to 38% more impact energy than previous generations and up to 20% more than competitors, the RH540M provides maximum productivity in all day drilling and chiseling applications. A variable-speed dial for both drilling and chiseling applications allows users to adjust tool settings based on the application and material they're tackling, with an easy to use selection knob to switch between hammer drilling, chiseling only and the versatile Vario-Lock function. The Vario-Lock mechanism allows chisels to be rotated into 12 different positions to optimize working angles to easily chip on various surfaces. The RH540M's new robust design keeps it working hard on jobsites. Featuring a 12 amp motor and weighing in at just 14.2 lb., the RH540M delivers up to 2750 blows per minute without the excess user fatigue during longer applications. Reliable service minder brushes on the tool keep the RH540M running at maximum capacity, clearly indicating when preventive maintenance is required. 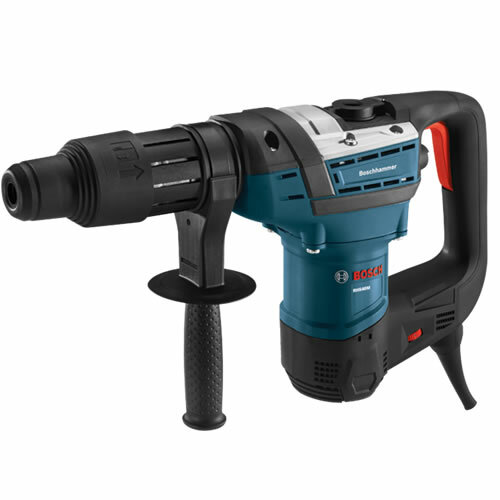 As with all Bosch SDS-max tools, the RH540M allows users to make tool-free bit changes with automatic bit locking, and offers enhanced features such as dust protection and maximum energy transfer rate. Max. Capacity - Core Bits: 1/2 in. - 1-3/8 in.